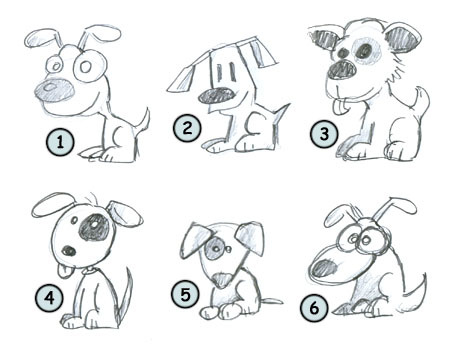 Drawing cartoon puppies: some fun facts before starting sketching! A puppies won't wag its tail until a month after birth. Dogs and puppies are domesticated since 12 000 years. The smell of a dog is 80 000 times stronger than the one of humans. 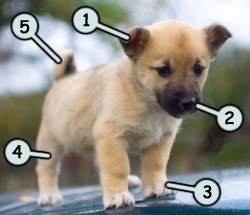 The small ears (1) and tiny tail (5) are what makes puppies easily recognizable. In this picture, we can also see the small but strong legs (4), the paws (3) and the black nose (2). It's not easy to keep proportions accurate while drawing puppies. You must keep the legs short and the head a little bigger compare to what you would have done with a normal dog. The basic shapes of a puppy are composed of rectangles for most of the body and legs. Triangles are used for the ears and tail. You can also use circles for the head and the body if you prefer. Once you can draw your little dogs more easily, you can play with those shapes and change them as you wish. Let's draw a simple puppy using mostly circles. First, draw a circle for the head and another circular shape for the body. Then, add the eyes, the nose and the ears. Notice how I cheated by drawing a long tail to my puppy. I also added a black patch to the left eye to give it a younger look. The tongue is only for entertainment purpose! That's it! Experiment by changing the size of the eyes (6), using only rectangles (2) or go for a more realistic look (3)! And don't forget to keep those body parts smaller than you would do for a normal dog! The black patch around the eye is an excellent way to get closer to your goal! Now you know how to draw puppies and it's not a secret for you anymore!